Happy Thursday! WOW…I just can’t believe it is August AND that school starts up soon. BUGGER!!! I don’t think I had enough of a break…wait…I don’t think I HAD a break! Hmmm…maybe that is the problem. 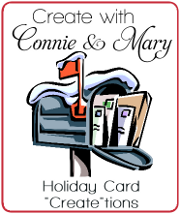 Okay I have to tell you…I LOVE my card for the Create with Connie and Mary Thursday Challenge this week. It is a cool sketch challenge. When I saw the skyline in the Calling All Heroes set I just HAD to have it! Yep…for that ONE stamp! I decided it would be PERFECT for the sketch and I just love the way it turned out! Lost Lagoon – 2 1/2 x 4. 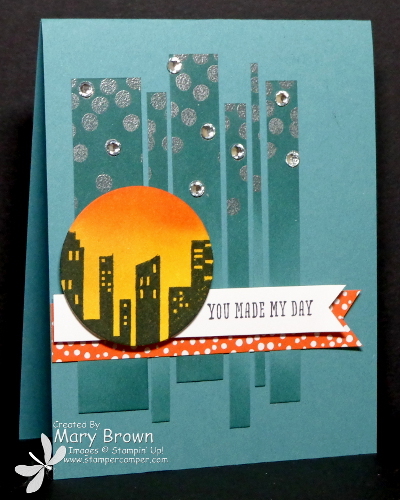 Stamp the Dotty background using Versamark and silver embossing. Rub over everything using Lost Lagoon. Cut into random width strips and add to card front. Confetti Celebrations (Tangelo Twist/White polka dotted pattern) – 4 x 3/4, cut into a banner and add to card front. Sponge Crushed Curry and Tangelo Twist on Whisper White, Cut out using 1 7/8 Circle Framelit, stamp skyline using Memento Black, add using dimesionals. Add some Basic Rhinestones to finish it off! This entry was posted in Create with Connie and Mary and tagged And Many More, Calling All Heroes. Bookmark the permalink. Ok, I totally have to CASE this card! I love how you used Calling All Heroes for the cityscape. Simply gorgeous! I also love the skyline in this stamp set! Love your card! This is a super awesome card! Love the embossed dots at the top! That stamp is really cool and works perfectly with this sketch! This skyline looks great with this sketch and I love the highlighted circle with that beautifully sponged sky. So wish we could get that stamp set in the UK! Love how the paper strips in the background looks like the night sky – this is awesome!